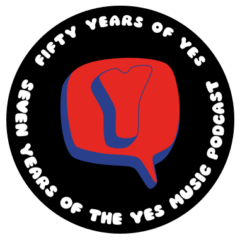 The forty-sixth episode of the Yes Music Podcast featuring the live tracks from ‘Keys to Ascension’. Do we need another collection of live performances of the same tracks? Is this the classic line-up for live performances? Well I gave a listen to the Awaken live version on this CD to me and maybe I’m wrong but it seems to be a bit dubbed at times I’m not sure however when seen Going for the one live for the first time it was like better than the album from top to bottom and I mean no disrespect for the recording at all,after all like you mentioned this is the lineup that is the most glorified and again not in a bad way. I think Rick’s work was a little overdone at times for this recording and you can hear Steve is slowing down as well that said I think it deserves four to four and half star out of five.My son who was lucky enough to go see them a few weeks ago was a bit critical of some of Steves work saying and I quote “he just can’t play the fast stuff anymore” personaly I think thats a lot of rubbish and he was all over Mr Downs because he did not like the way he did Awaken.Now you have to remember my son was trained in piano and Awaken is very special to him having learn how to play that at age 15 to the letter I guess makes him some sort of critic. Sorry don’t mean to get of track but I do believe that this is definitely something to own and to listen to the brilliant work that they all put into this album.I really liked your suggestion about the Prog rock that would be awesome. Hi Paul, as you heard, I mentioned your comment in the latest episode. Thanks so much for adding it here. I love the Keys to Ascension live version of Awaken. At least the second half. It is slowed down a bit, but it definitely adds to the dramatic effect. The tension and release in this song is amazing, but it is especially pronounced in the live version. Listen to the huge, final organ blast just before the band quiets down and Anderson reprises ‘high vibration go on…’ On the live version, it lasts quite a bit longer, and the release after the long tension is explosive. I love that they take their time. The studio version now seems almost rushed. The slowed pace increases the grandeur of the music. All my opnion… of course.! I have to agree that the Keys live tracks are among the finest I’ve heard. I go thru periods of time when I don’t listen to Yes. But each time I get get back into the band I am blown away. This time is no exception! Thanks Doug. I understand Steve Howe had a difficult time sorting them out but it was worth it!